Great for large-scale printing, the Epson SureColor SC-T5200D 36-inch colour printer can print on media as wide as 914mm and as thick as 1.5mm. The SCT5200D printer comes with the ability to hold two paper rolls, making it a great choice for busy design, engineering, architecture and print shop environments. The SureColor SC-T5200D inkjet printer is designed to print GIS, CAD and other graphics applications at a high speed and resolution. The Epson SCT5200D SureColor printer comes with USB and Ethernet ports as well as a direct scan-to-print feature. It's a sleek printer that measures 1,405‎ x 1,126 x 1,128mm, with its wheeled stand making it easy to move around and store in any type of set up. The Epson SureColor SC-T5200D 4 colour large-format printer comes with a 1GB hard drive and the option of a 320GB HDD. What’s more, its auto-media loading maximises productivity. 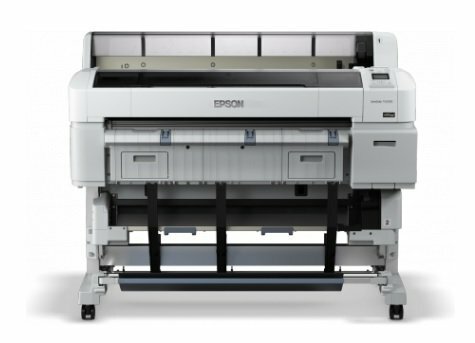 A variety of media sizes are compatible with the Epson SureColor SC-T5200D, with the first page coming out in just 28 seconds when using A1 size media. It boasts an auto-cutter, can support thick paper and can produce borderless printing on media as large as 914mm. It’s operated from the front and has an 6.8cm colour LCD, as well as featuring permanent printheads. The original Epson SC-T5200D colour inkjet print cartridges use only top quality UltraChrome XD inks that are water and smudge-resistant, delivering vibrant, clear prints time and time again. The Epson SureColor SC-T5200D CAD / GIS printer doesn’t come with wireless networking, which would greatly increase productivity. As well, the SureColor SCT5200D printer would be more user-friendly with an automatic duplexer.